Since 2013 I participated the Critical Mass in Augsburg quite regularly. The Critical Mass exists in Augsburg since 2009 and for several years there is also a blog for that. The operators of the blog, however, are anonymous and the posts there sometimes tend to politicize the Critical Mass in a way, which causes more harm than support for the reputation of the action. Some other participants told me in June 2014 that they no longer want to ride because they do not want to be clamped for political actions that have nothing to do with the idea of the Critical Mass. 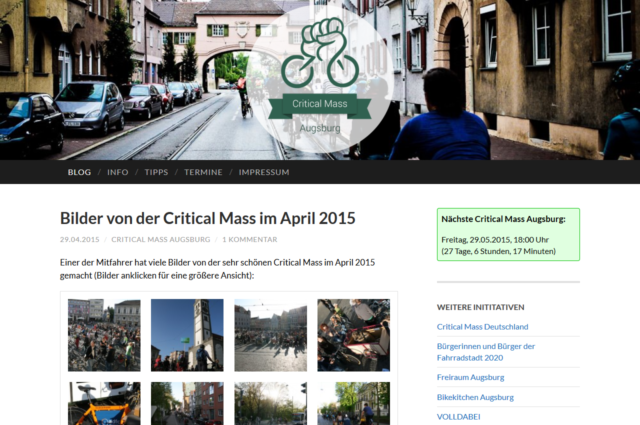 Therefore I built a more neutral website in Juli 2014 as an alternative, inspired by the websites of the Critical Mass Hamburg and the Bikekitchen Augsburg: http://criticalmass-augsburg.de. Even though I’ve been living in Berlin since end of April 2016 I still keep the website online for my friends in Augsburg.